‘Mundic’ Assessments: 1997 – 2016, What changed for the 3rd Edition? During the 1980s and early 1990s the initial concerns around mundic block within houses in Cornwall and West Devon resulted in the refusal of many mortgage companies to lend money to any house built from concrete between 1900 and about 1950. The vast majority of these houses were needlessly blacklisted but ignorance of the causes behind mundic block degradation hampered policy makers. The release of the initial mundic guidance by RICS in 1994 returned ~70% of these affected properties onto the approved lending list. Following recommendations of the 2nd edition of the mundic guidance (1997) that percentage increased to ~80%. This article is the second of two posts and in it we explore the main changes that have occurred between the 2nd (1997) and 3rd edition (2016) of the mundic guidance (effective 1st January 2016). The 3rd edition of the mundic guidance clarified some of the terminology being used (Class A, B & C) along with the sampling protocols used by surveyors. However, it also incorporated several minor changes to the assessment of potential Mundic block that had developed over the intervening period. The cumulative effect of these changes were to give more options to home owners and surveyors to pass concrete as stable (after stage 2 or stage 3 assessment) if there was sufficient evidence to do so. Density test clarifications: The development of the density test started before 1997 and applies particularly to mass concrete footings made with mine waste (Group 2-2) aggregate. It was in place for the 1997 edition with some minor amendments subsequent to that. The current upshot is that for mass concrete footings, regardless of aggregate type, it is possible to obtain a Class A classification if the concrete is well made (i.e. aggregate is well graded, without too many “figs” and with low void space) and sufficiently dense (>2000 kg/m3 for a compliant sample). The density test is generally only applicable for footings samples and most mortgage companies would not accept or surveyors recommend a density test for mass concrete in the walls. 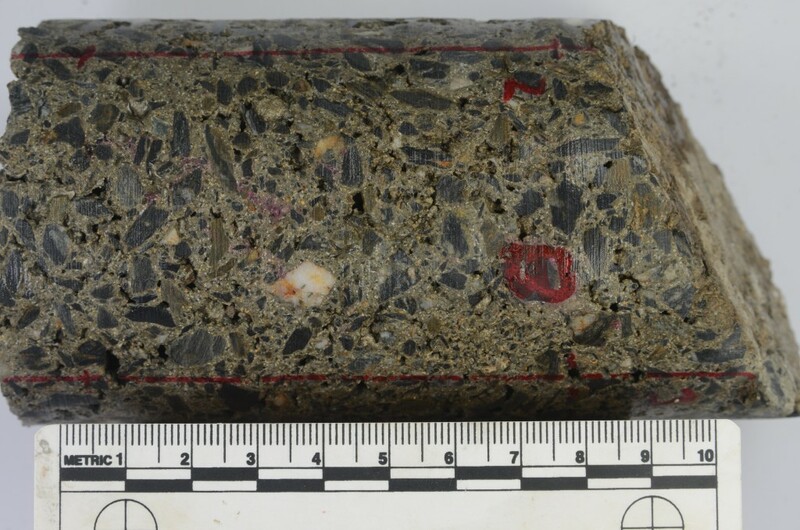 An angled 75 mm core containing pelite mine waste that has been marked up for a density test. Sulfide limits for Granite Mine Waste: The upper limit for permissible sulphide content in granite mine waste was raised to 1% in 2003. This only applies to granite mine waste and is only effective if there is no evidence of in-situ aggregate alteration at the microscopic level, or of concrete degradation at the structural level. The aggregate material must also be essentially quartz, stable silicate and stable oxide phases. Pyrite and chalcopyrite encapsulated in stable aggregate fragment. The slight red staining is not in-situ iron-oxide formation but red brick smearing from the drill bit. Miscellaneous Sedimentary Rock Classification: The use of sedimentary material was particularly common in rural areas and is often extremely local in nature, probably sourced from the material excavated for the building plot. Several general sub-types are observed (e.g. a chert rich variety from Lydford, Devon, and a type often mixed with beach sand near Newquay). Several were initially considered unstable, though by 1997 many of these had been recognised as predominantly stable (e.g. the use of Devonian Limestone). This was further extended in May 2000, when BRE expansion testing showed the essential stability of most sedimentary aggregate types. Now sedimentary aggregate types are generally considered stable, unless there is significant evidence of lamination-parallel spalling and/or suspected in situ oxidation of fine-grained framboidal pyrite (occasionally found in laminated mudstones around the villages on the North Coast of Cornwall and some of the mudstones near Launceston). Expansion Testing: The most significant addition to the Mundic guidance over the intervening years has been the option for an expansion test on concrete samples previously classed as unmortgageable but which currently show no significant signs of degradation, either microscopically or structurally. It is at least a 250 day test and measures the linear expansion of selected concrete cores in a controlled humid and hot environment. It is particularly suited to well made concrete block that has nevertheless been determined to be Class B (unmortgagable) by the Stage 2 petrography test, commonly because of the mixing of potentially unstable and stable aggregates where the resultant deleterious aggregate content was over the 30% threshold. Of the Stage 3 expansion tests undertaken by Petrolab, very approximately 60% of concrete has met the required criteria for re-classification to Class A. Many of these tests unfortunately offer no support to houses that already contain unsound concrete (Class C) or for which the walls in particular are built out of poorly made concrete containing aggregate commonly known to be unstable (e.g. lead mine waste). However, the effect of the changes introduced with each successive edition of the RICS mundic guidance has been to reduce the number of properties that become needlessly blacklisted, and to allow more properties to become mortgageable even if it requires Stage 2 or Stage 3 testing to prove the stability of the concrete. Hi Michael, Thank you for your question. In answering it – the main period of construction affected by Mundic block is the 1900s to ~1950. In a few areas, houses were built using Mundic block up to the 1960s (possibly a fraction later). But there is scant evidence for the use of Mundic block since then, and certainly not in the 1990s. Occasionally extensions that were built in the 1970s / 1980s get tested for Mundic block but only because there isn’t the paperwork to satisfactorily prove that they weren’t built earlier. Regarding a house built in 1997 there should be no risk of that being built from Mundic block. If the house is built in 1988 then it should not need a mundic test. Chris, just a thought how would one find out how a property in Cornwall was constructed? A surveyor would be your best bet for ascertaining what a property is built from, assuming it isn’t clearly visible because of a thick render coat. In the instance where you are testing a house for Mundic block for example a surveyor will come out and drill into uncertain walls to collect samples for assessment. Failing that, hire an angle grinder, cut the render off, have a look. Stick some new render on afterwards. Repaint. But if the whole house is covered and you want a survey done then a getting it done by a qualified surveyor would be your best bet. One would suggest though, that if the whole house is rendered then the render is covering concrete block. Could 20 year old cavity wall insulation – type unknown – cause problems in a property tested as Mundic B? The short answer is possibly. “Mundic” type degradation in concrete block is usually caused by the breakdown of pyrite that is present in the mine waste. The presence of cavity wall insulation may retain warmth and moisture in the concrete blocks. Both warmth and moisture would increase the reaction rate of this pyrite breakdown, and therefore cause problems in property with Class B concrete. Hi, wonder if you can help me. We have a mortgage on a property which we have now put up for sale. It was built in the 1930’s and our estate agent asked if we had a mundic report to which we said no. He recommended that we pay for one, which we did, and it came back as unclassified and therefore B and not mortgagable. We have been told to go back to the Building Society and request a copy of the surveyors report for when we re-mortgaged in 2007 but have been told he only did a drive by. Both the estate agent and ourselves are absolutely mortified that he only carried out a drive by in an area which is beset with mundic block properties. We live in Cornwall. The Building Society have taken up our complaint and come back with the answer that they were satisfied that the LTV was sufficient for their needs. We were also asked if we had told them about any p0roblems with the building to which I stated I am not a surveyor and that is what he was employed for. At the moment we have our house insured for £550,000 and although the mortgage is only a quarter of this, nevertheless is it fair that the building society only covers their own portion and not the lender. After all, surely they are in business to help people sell at a higher rate than they bought in the hope they will re-mortgage with them again. My question after all this, in your opinion, knowing that the vast majority of houses in Cornwall which are built in 1930 should the surveyor made a better assessment and actually got out of his car to look at our property, not only to protect his Building society but also us. Could anyone give us some advice as to where to go next as this has put us in a very difficult situation and with the house now only being a cash sale that we probably cannot purchase another house with the left over proceeds. Dear Jo, I am sorry for your situation but unfortunately I cannot comment on the work undertaken by a surveyor. We are not surveyors ourselves and it therefore wouldn’t be appropriate. Regarding the mundic test itself. If you have an “unclassified” result that doesn’t automatically entail that your concrete is Class B and therefore unmortgageable. Now, that may still be the case but all unclassified means is that a stage 2 test (density or petrography) is required for classification. It would mean that you have something in your concrete (be it mine waste or poor quality concrete) that requires classification but some concrete does go through stage 2 testing and come out as A2. If you are happy to send your address details to me (chris@petrolab.co.uk) I can at least look up if we did your concrete test and whether the stage 2 test would be worth a try. We have recently bought a bungalow close to Bude, Cornwall. A structural engineer came round to do some load calculations fora steel as we are doing some remodelling, but said they are unable to give us the calculations until we have tested for Mundic. The mortgage surveyor never mentioned getting a Mundic test and we are surprised that this has been suggested as the bungalow was built in 1965. Is it possible for a 1965 built house to have Mundic brick? There is no specific upper date for the use of Mundic block, though it is far more common in the 1900 – 1950 timeframe, where testing for mundic block would be considered necessary. The use of British standards in aggregates post 1950 and the practice of building larger estates using factory block-making plants encouraged much greater quality control. There are some later isolated examples (i.e. later than 1950) of the use of poor aggregates, normally the result of handmade DIY blocks. Evidence for this has been found in the years just after 1950 and (very rarely) up to 1965. So, yes it could be possible, but it is highly unlikely, especially in an EX postcode area. Ultimately it would be for a surveyor to decide if a test was necessary. It is very unlikely that a second test will produce a different result to the first test. Houses can’t ‘catch’ mundic in that sense. Nevertheless, a mundic survey only tests a sub-sample of the concrete in the house so it is possible that whilst the original survey picked up no mundic concrete, a second survey would detect a coarse of different (class B) concrete that was not previously tested. It is very rare but does happen occasionally. Essentially, if it passed as recently as 2009 the risk of a subsequent failure at a second test is very low. The main benefit of a re-test would be it would be undertaken under the 3rd edition of the mundic guidance and would certainly be valid for another 6 years at least should you wish to sell the property on as your circumstances had changed. We bought a property three years ago that had one wall categorised as grade C from a scratch test(?) of the materials. Three other walls all categorised as grade A, however, the summary states the property contains no mundic. Our house was built in around 1850, but the wall with the grade C category may have been an extension wall, time of building unknown. This wall is covered in render, so would the scratch test have tested only the render or would it have tested the wall? How can the report say there is no mundic at the property but give a grade C categorisation to this wall? How can I find out if you carried out the testing? Since buying we have had a structural engineer check the wall to advise us on the best course of action. He was confused by the report but after checking the wall said he felt there was no remedial work required. The house is in Probus, so from looking on maps a low risk area. Do you have any suggestions for what we should now do in order to sell the house? Thanks for your e-mail. The quickest way to see if we have done a concrete screening test for your property would be to use our search facility (https://www.petrolab.co.uk/mundic-property-search/). If you have a RICS report with the concrete types to hand then give us a call and we’ll happily discuss what the results mean. We have tested properties from Probus before so yours might have been one of them. In answer to some of your queries. A house built in 1850 wouldn’t need a mundic test and it will be the prospect of concrete in the extension that needed the testing. A surveyor would collect samples from your house, usually using a drill – the aim being to collect representative concrete for us to assess and assign to A, B or C, and with an appropriate concrete type (China Clay-Waste etc…). Given that Class C has been recorded from a previous test you would likely need another test to prove that it wasn’t class C and that no remediation work is required. In order to arrange that test there are a list of surveyors at the bottom of the page of the link above who would be able to assist. we are currently looking at purchasing a Victorian built property in Porthallow said to be made from local Porthallow stone . would it be wise to have a Mundic Test carried out or is the construction date too early, hence unlikely to be affected ? If the property is stone built (Walls, loft, foundation etc…) then it won’t need a mundic test. If the construction date is pre-1900 then that is the likelihood. Just keep in mind that any extensions that may have gone on to the property may have been built in-between 1900 and the 1950s / 60s. This being the case they may be built from concrete and this would need a mundic test. Do let me know if there are any questions. In the process of buying a house with A2 mundic. I am not sure whether I want to risk it. Is it possible the Munich will cause problems? Sorry for the late reply. The A2 assignment means that the concrete should perform as well as ordinary concrete. This doesn’t take account of levels of general maintenance but if the house is cared for in the same way as a normal house then there should be no issue with A2 concrete. Hi Chris. I am a mortgage broker and currently have a client wanting to take out an Equity Release mortgage. There was a Mundic Report indertaken in August 1997 by the previous owners of the property and the result was classification ‘A’. The report has now been reassigned to my client and the Chartered Surveyor has inserted a paragraph confirming that it is equivalent to the new post January 2016 category of ‘A1’. The lender’s valuer has said that this report is not acceptable as the tests were conducted 20 years ago. Is this a reasonable request, or totally unecessary? With regards to previous Mundic tests it is up to the surveyor and the lender to be satisfied that there is no need for a re-test and either may request one. There have been a few changes to the Mundic guidance since 1997 (2nd edition of the guidance) though generally minor as written above. I can’t comment on individual tests but we do sometimes receive samples for re-testing from properties tested around 1997. Please help. We had a Mundic test done in December 2010 came back class A clear. Our buyers have seen and have a copy of the report, but have been told to have another one done. They have been told that the certificate only lasts for 6 years. If a house is class A is it possible to get Mundic in the future? How many test does a house need every time it changes hands? It is going to look like cheese! Individual surveyors and lenders may request a re-test if for any reason they want additional assurance on top of the first test. Concrete itself cannot catch ‘Mundic’ so all the concrete blocks that were tested in 2010 that were returned as Class A will still be Class A (unless poor general maintenance has affected the concrete, but that would not be Mundic problem but something altogether different). However, any Mundic test does not test all the concrete blocks in a house. It is a sampling survey and the aim is that the concrete blocks tested in any one survey are taken as representative of all the concrete blocks in the house. In nearly all cases that would be a good assessment but a surveyor or lender may wish to undertake a re-test to check the efficacy of the initial sampling survey. There is no specific requirement to test every 6 years but the surveyor or lender may be following their own internal guidelines in this regard. We are in the process of buying a house in Looe, Cornwall and according to the last survey the owners said that the property was built approximately 1970 and reassured us that it is outside the catchment for Mundic. We have since discovered through the electoral register that this property was indeed first occupied in 1965! 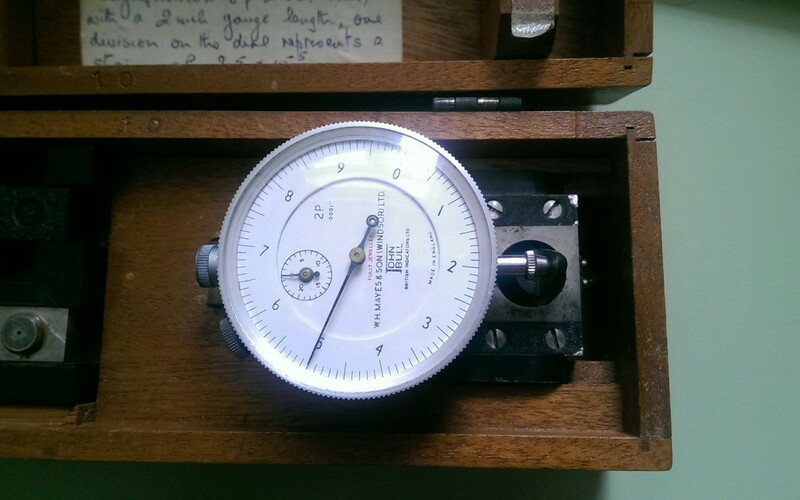 Accordingly, our surveyor has assessed that the build year is more likely to be 1964/65 and advises that we ask the owners to undergo a Mundic test but so far they are not too keen……! What would you suggest and would this property be outside the critical years and not require testing? Thanks. Sorry for the slow reply – I was on leave for half term. The time period from 1950 to 1965 is a tricky one as most house builders had moved on to stable aggregate supply for their concrete manufacturing needs, and house building tended to be larger estates and covered by tighter regulation. Nevertheless, a few mundic related properties were built and it is generally up to the advice of the surveyor as to whether you are in an area that requires a test, (or whether the house carries any signs of mundic related degradation). It is essentially the opinion of the surveyor that counts and if they are of the opinion that a test is required then a test should be carried out. hi,we have just had a mundic test the surveyor states there is a wall in our kitchen loft,which is our nieghbours which he believes has mundic but we are waiting for results.how would that affect our sale of our house as the buyers will need small mortgage. I would wait until you have the results and then speak with your Surveyor. Alternatively, we would happily discuss any results that you have with you. The implications are that mortgage companies won’t lend money on a property that fails a mundic test. If it is only a small portion of the house then there are options to remove and replace the bad concrete but these are best discussed with your surveyor and builder as to how feasible that would be. Hi we are in the process of buying a house in Launceston. The mortgage surveyor has come back requesting a mubdic test. The house was built in 1880 and extension done in 2001 we have been advised that because there is a lot of concrete rendering this is why they want it testing. If the tensor does have mundic what can be done about it for mortgage purposes? Render is not covered under the current RICS mundic guidance for testing. It wouldn’t therefore be appropriate for a mundic test. On the information that you have provided the main reason a mundic test would be required was if the date of the extension could not be proved as being 2001. We are in the process of buying a property at Pelynt which we were told was built 1972 turns out its 1966 and it appears to have been inserted between two properties as the number is 2a. Should we insist that the sellers have a mundic test is there a way of finding out if surrounding properties are mundic?? I am very worried as we are due to complete by 1st august we are cash buyers but what if the property has to be sold?? Thank you for your question. There is more evidence around the eastern edge of Cornwall that mundic blockwork was used beyond 1950. It isn’t out of the question that a mundic test would be useful, particularly if the property building commenced before 1965, or the blocks that were used were ordered during 1965. One tool that might help is our mundic search facility. https://www.petrolab.co.uk/mundic-property-search/. You can use the front end of it for free and it will tell you if we have tested properties in your area and what their addresses are. (N.B. it won’t tell you the results as we are not at liberty to give those out but it may be useful for you to see whether those properties have been tested before). Also, do speak to your surveyor. They will know your area and be able to make a visual assessment and recommendation based on the property and their local knowledge. If they think that a mundic test is advisable or not necessary I would heed their advice. Unfortunately, We are not the best people to ask about rebuild costs. You can certainly knock down and rebuild as a way of removing all the mundic concrete and it has been done successfully to good effect. But your best bet would be to inquire with a builder and a surveyor to make sure you remove everything and how much it would cost. Callington has a variety of concrete types most of which are benign. However, if the property has already had a mundic test and has been deemed unmortgageable then the concrete in question most likely had a type 2 aggregate. Without the mundic test result it is hard to say much but if the aggregate did come from the mines near Menheniot (and some of the properties in Callington did use aggregate from those mines) then this would make it Lead ore mine waste which would certainly be reason to fail a mundic test. Class B means that the concrete is currently performing as normal concrete but does contain ‘mundic’ aggregate. That means that there is no guarantee that it will remain structurally sound over the length of a typical mortgage – even with the best care. Menheniot aggregate can perform well at times but it is also one of the aggregates known to fail quite quickly when it does go. Regarding the chimney. Flue gas may attack concrete binder and is a particularly bad idea in an unlined flue. Even if the flue is lined the extra heat may promote the aggregate breakdown (on this last point I am not 100% sure as I don’t know the thermal conductivity of modern flue liners). Hi Chris, what a useful site. We are currently thinking of buying a house near Pelynt with an extension that we have been told was built after 1975, but there is no documentation. The previous owners had a mortgage taken out in 1992 and there was never any suggestion of requiring a mundic test for that. We imagine therefore the property is probably OK. What do you think? Many thanks. Sorry for the slow reply – I have just returned from annual leave. If the extension was built after 1975 there wouldn’t be a mundic concern but if there is no documentation then a surveyor may still recommend that a mundic test is undertaken. Ultimately if the surveyor and mortgage provider are happy that no mundic test is required then the property is probably OK.
Hello, I have just purchased a property at auction which has meant that block, and I wondered if you can tell me if there are any consequences of having a wood burner fitted as I have heard something about mantic block and heat? It would depend a little on the exact concrete and the current state of repair. The main risk with fires and mundic block is that in unlined chimneys the flue gas attacks the concrete binder and over time causes the concrete to crumble. This can happen in good concrete as well as mundic block concrete. Even if the flue is lined the extra heat may promote the aggregate breakdown (on this last point I am not 100% sure as I don’t know the thermal conductivity of modern flue liners). The heat would accelerate the breakdown of pyrite in the mundic aggregate and, particularly if there is any excess moisture around, speed up the deleterious reaction. As mentioned above though I don’t know how thermally conductive modern flue liners are which is an important consideration in this question. Hello, we’re currently buying a single skinned block built house, built in 1954 in West Cornwall (Tr26). A mortgage valuation survey has been done and the lender has not asked for a mundic survey to be completed however we are looking at getting a separate homebuyer survey and and that surveyor has said we should get a mundic test done. The cost of all these surveys and searches are building up. What’s the likelihood of a 1954 house having Mundic? The likelihood is low. The main period that needs to be covered is the 1900’s to 1950 – after then the standardised use of suitable aggregates in making concrete became commonplace. However, it is not impossible, and certainly, in East Cornwall, it is highly recommended to test up to the 1960’s. For West Cornwall, you will probably be OK but I can’t guarantee it. I live in a 1950s stanbury house in plympton Plymouth Devon. I am selling my house but the vendors surveyor has said I need a mundic and radon test. I don’t know of anyone e else near me that has had this problem. Is there any evidence of mundic in this area post 1950? Sorry for the slow reply. There is evidence for Mundic concrete in the East Cornwall area, post 1950, and rarely up to ~1965. It is particularly associated with aggregate derived from the old lead mine at Menheniot. This isn’t that far from Plympton and the aggregate has been known to be used further afield than that area immediately around Menheniot. I’m buying a property which had a Mundic test done in 2014 ind it came back an ‘A’ Pass. The lenders are asking for an updated Mundic test. But the old one is valid for 6 years? Do i need to get a new test done again? As I understand the current surveyors requirements the old test is still valid (it would be good to confirm this with the surveyor in question) but typically that is what they tell us. However, a lender can insist on a second test within the 6 year period. Ultimately it is up to the lender more than anyone, as in any mortgage it is a large chunk of their money that is at risk. I have owned a property in Camborne for over 12 years which is mundic block – it is mid terrace in very good condition. I am thinking of selling and wondered if there is a site anywhere which advises on the mundic grading for houses in certain streets ? or can I find out anywhere if any neighbouring properties have been tested previously and what the results were ? My current tenants would like to buy the house but would need a mortgage. You can use our website to find out whether a house has had a mundic survey. The property search facility (https://www.petrolab.co.uk/mundic-property-search/) is free to use and will tell you whether a house has been tested. You can also pay £3.99 on the same part of the website to find out which surveyor did the test, and whether they are still in practice. The £3.99 also gives you the reference number for the test so if you follow-up with the surveyor in question you can quote the reference number. How much detail they can give you after that is their jurisdiction. However, because the tests are paid for by the homeowner (or homebuyer) and carried out by the surveyor, they are the two groups that own the results of that test and the results are therefore not publically available. Hello, I am considering purchasing a mundic B semi detached house in Looe. If I install gas central heating, tend to the leaky roof and clean the roof and guttering and make the house sound and warm, is the mundic degradation likely to slow down? Or regardless of the money and care and time I put into this property will the property concrete still degrade and need to be demolished? 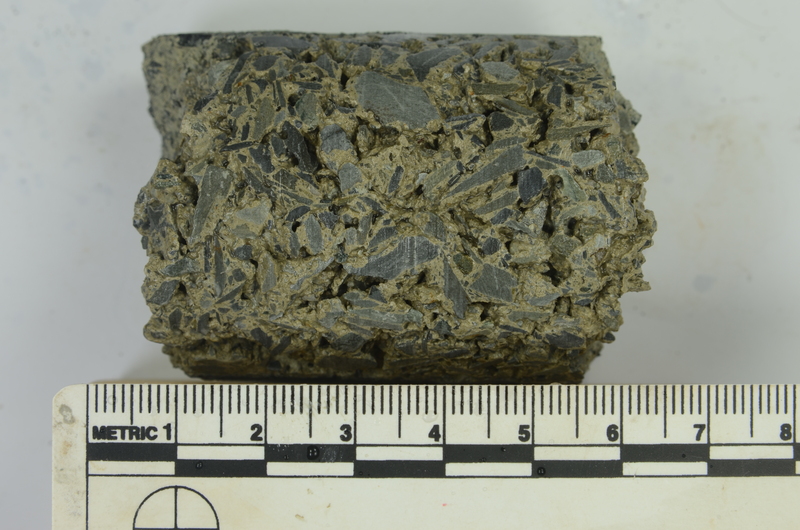 It contains lead ore processing waste group 2-2 aggregate, at least 60% (visual estimate) of the aggregate consists of partly cleaved grey mudstone, liberated sulphides and sulphide-bearing veinstones. The visually estimated residual sulphide mineral content is <0.5%. There is evidence of trace in situ aggregate oxidation shown by patchy iron oxide impregnating haloes around the edge of some mudstone aggregate fragments. 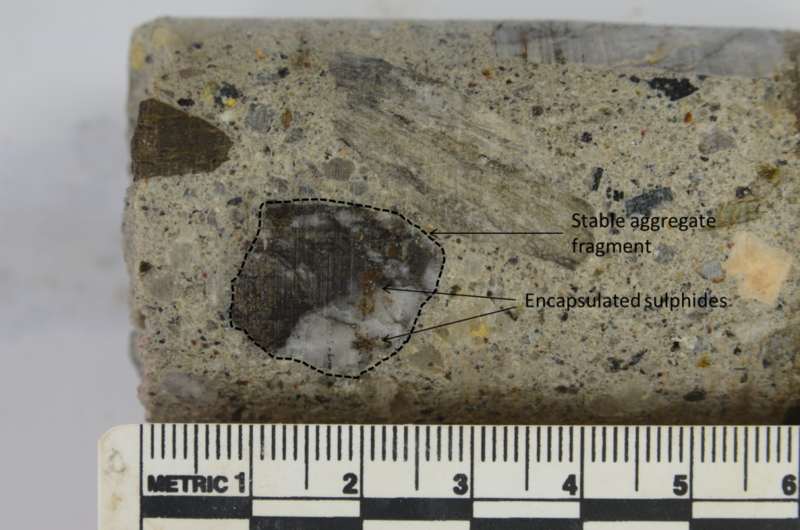 There is also evidence of trace aggregate related degradation, including spalling into void spaces and weak internal fracturing. Speaking in a personal capacity I wouldn’t recommend purchasing a property containing lead ore mine waste. There is a chance that the concrete is more stable than it appears – and a Stage 3 test might lead to a reclassification to group 1-6 (essentially stable). But this is very unlikely and unless a Stage 3 test has been already recommended I wouldn’t pursue one. By in large, lead ore mine waste is known to perform badly and degradation can proceed quite rapidly. There is only so much that can be done, even with the best care and attention. If the property is that old it wouldn’t need a mundic test. Concrete only became widely used in the south-west after 1900. However, there may be extensions to the property that would need testing, especially if they have concrete in, or if the date of their construction cannot be verified. Hello, I’m in the process of buying a property in Cornwall which had a Mundic test in 2016. It passed. Would you recommend a re-test as the last one was fairly recent? I am also led to believe that the categorisation changes happened before 1/1/2016- is that correct. If the surveyor who undertook the test is happy to re-assign the results of that test to the current year, and the lenders are also happy on that basis. Then that should be fine. 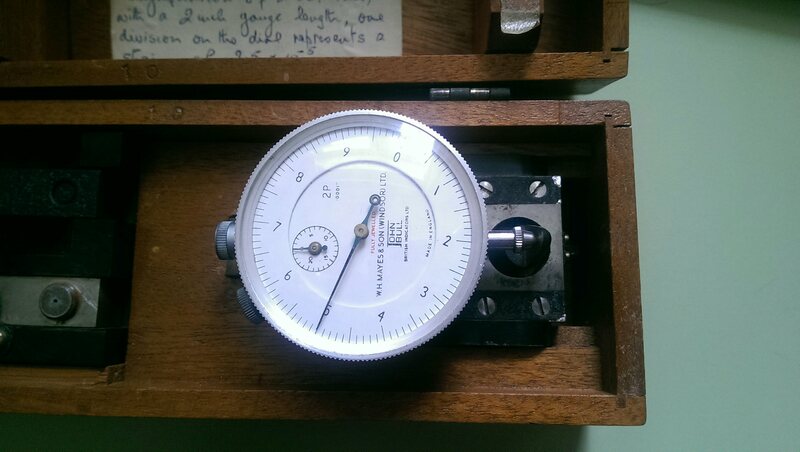 Mundic doesn’t ‘spread’ and isn’t ‘catachable’ so if the surveyors are happy that they appropriately sampled and tested the house (and why wouldn’t they be) then there isn’t much warrant for a re-test so soon after the last test. The update to the 3rd edition of the mundic guidance came into effect on the 1st of January 2016, so a test in 2016 will be under the parameters of the most recent guidance. Our house had a Mundic test in 1983 which was clear. In 1994 we had a Mundic test in our name under RIC guidelines which was Category A. Now we are in the process of remortgaging. The bank’s surveyor/valuer has requested a Mundic test but the bank won’t send the surveyor/valuer our Mundic report because it’s over 6 years old. They say we should get a new test. I read in the RICS Guidance Note 3rd Edition in paragraph 1.5.5 that says “Existing reports and classifications from previous tests remain valid”. What do you think we should do? Send the surveyor/valuer our Mundic report directly or get a new test done? Thank you for your questions. The test in 1983 would no longer be valid and the test in 1994 would have been undertaken under the 1st edition of the mundic guidance. This has since been superceded by the 2nd edition (1997) and the 3rd edition (2016). As part of the most recent guidance existing reports are valid subject to the recommendations of the surveyors and lenders in question (and 6 years is often a practical limit that is applied), but certainly, nearly all mundic tests undertaken under the 1st edition are redone because there were some significant changes between the 1st edition and the 2nd edition of the RICS guidance. Without knowing the details of the bungalow in question and without being a chartered surveyor there is only so much I can give in advice. Well looked after houses can be fine for a long time, possibly even indefinitely – but if the concrete has been assigned as Class B then there are no guarantees, even with the best care, that it won’t degrade and crumble. The actions of your neighbour on their property probably won’t have much effect on your concrete but if theirs is also a Class B concrete and that was to start to fail then that failure would in simple constructions terms affect your property. We are near to selling our house built in the 1920’s near Redruth. It was tested in 1999 with no problems. It has just been tested again and failed. Do I have any legal claim against the original surveyor as mundic does not grow. The most frustrating thing is the persons buying had the test done and will not divulge what area failed or what grade it is. Is there a database where this is recorded that I can access? Sorry to hear about the failure on re-test. That’s very unfortunate. There would be no legal claim as whilst mundic does not spread it can be missed on a random sampling survey, and whilst that is very rare it does occasionally happen. Normally there would be a particular reason, such as random course of blocks, or an unknown area on the first test (concrete layer on top of old stone wall). However, it would be very helpful to you to know where it is, and also at what stage the re-test has failed (Stage 1 or Stage 2). Your best bet would be to contact the surveyor in question who undertook the re-test and see if they can re-assign the test results to you. There would normally be a fee for this and there may be a time-limited clause as well (such as the test result can’t be reassigned within 1 month of the original test). But they would be best placed to advise of a course of action. Thanks for your reply. I now have a bit more info. My propert has now been classed as a C so I mortgageable from an A in 1999!!!! The property does not have mundic but an internal wall has poor concrete. I was under the impression that these categories were solely for mundic if so surely this is incorrect. Also I was under the impression that a certain percentage had to be mundic. This is confined to one very small internal wall. All exterior and connecting walls are good. Any further guidance would be appreciated. The mundic test will also, as part of the routine, identify concrete that is in a bad state of repair. Failing a mundic test doesn’t indicate that a certain percentage of the house is mundic, and may just mean that a small portion of the house is affected. The upside of this, particularly when only a small portion of the house is affected, is that repairs can be made to resolve the issue and the house should then pass a subsequent test. Occasionally homeowners undertake remediation in these instances and a follow-up mundic test is requested to confirm the reclassification of the affected area from a ‘C’ to an ‘A’. The house then becomes mortgageable again. For any remediation work, you should talk with a surveyor and a builder to guide you through what would be required to resolve the area that has been classed as ‘C’. We are thinking about buying a mundic class A property- can we get a mortgage on it please? Are all high street mortgage lenders ok with class A? From our recent experience. All high street mortgage lenders will lend on Class A properties. The design of the mundic test is such that should concrete come back as Class A then it is as mortgageable or safe as normal concrete. However, for some mortgage lenders it will depend on what stage the concrete reaches it’s class A classification (some require a stage 2 test, and I believe there is one mortgage lender that won’t lend money on a Class A concrete that was reached after stage 2 testing). Though to note, most concrete that receives a Class A classification does so after Stage 1 testing. I am currently in the process of purchasing a property in Tavistock. I had never heard of mundic until my surveyor told me about it. He told me that although the property had a brick base he was pretty certain that it was block above but had been unable to find anywhere which would allow him to be certain, it appears the property has been re-rendered over render. He then told me about the risk of mundic in blocks and asked me to ask my seller if a mundic test had ever been carried out on the property. Whilst waiting for a reply I have found your site online and have searched the property and found that a test was carried out in September 2008 by surveyors who are still in business and I could contact them about re-assigning the report. I have sent this information to my surveyor. I am purchasing the property without a mortgage but I was wondering if you would advise a new mundic test to be done due to the changes in RICS Guidance. I am aware that it appears the tests are only valid for 6 years so was wondering if, depending on the result of the 2008 test, if it is worth getting a new test done now. Thank you for your question. It is always best to speak to the surveyor who carried out the test in question. The changes to the mundic guidance in 2016 were largely a confirmation of the recommendations of the 1997 guidance with some acceptance of additional official testing methods (such as the Stage 3 test). Samples that passed in 2008 should also pass in 2018. The 6-year limit is surveyor specific, and a test is valid for as long as the surveyor in question is happy to reassign the test for the property. I am currently looking at property in falmouth, I just received the Mundic report. They took 9 samples, 8 passed at stage 1, but one went to stage two and was found to be fine, however the whole house is now classified as A2. I understand one lender doesn’t lend on A2 which has me worried that more may follow. Would you put all your savings in an A2 house or walk away? The A2 pass means that the concrete is deemed as safe as normal concrete. Any investment of savings carries risk but in principle there is no more risk to a property with A2 concrete compared with a property with A1 concrete. I purchased a house in Marazion in 2013 cash purchase. It was built in 1964.The building is totally rendered and I can see concrete blocks in the loft. When I purchased I just assumed that they were normal concrete blocks. They look like standard industry blocks and therefore at the time of purchase I did not think they would be Mundic. Perhaps I was a little ignorant of what Mundic refered too. Certainly clear now. It was only as a result of a conversation with a local estate agent whom I had contacted in relation to putting my property on the market who made reference to mundic. Is it likely that the property could be mundic blocks. It is also built into a hillside on a concrete base. If the property was built in 1964 then it is very unlikely to contain mundic. Really, after the 1950s there are only a few isolated pockets here and there. Getting a mundic surveyor to have a look is your best bet and as it was a cash purchase you may not have needed one first time. There is a list of surveyors at the bottom of the page (https://www.petrolab.co.uk/mundic-property-search/). Thank you for the comments on this blog post. We will be preparing an FAQ’s post that covers all the questions that have arisen from the feedback received here. In the meantime, we will be closing the comments facility on this post. We would always recommend speaking to the surveyor associated with your property, or if you are requiring a mundic test contacting one through the links at the bottom of the following webpage (https://www.petrolab.co.uk/mundic-property-search/). This link can also be used to search for whether your property, (or the property you are seeking to buy) has been tested by us. Finally, if you have had a test and have the results to hand and want to discuss what they mean then feel free to give us a call and we would be happy to advise. Enter your email address to subscribe to our News so you get the latest updates straight to your in-box. Chris Brough on ‘Mundic’ Assessments: 1997 – 2016, What changed for the 3rd Edition?